Belissont, R. ; Munoz, M. ; Boiron, M.C. ; Luais, B. ; Mathon, O.
Germanium is considered a critical element, with a demand that has sharply increased due to booming high-technology industries. To understand Ge incorporation mechanisms in natural systems, we investigate Ge speciation in Cu-bearing sulfide minerals using synchrotron X-ray fluorescence (XRF) chemical mapping and Ge K-edge µ-X-ray absorption near-edge structures (µ-XANES) spectroscopy. The samples investigated include (i) a homogeneous chalcopyrite from the Kipushi polymetallic deposit (Central African copperbelt, D.R. Congo) and (ii) a zoned Ge-rich chalcopyrite from the Barrigão Cu deposit (Iberian pyrite belt, Portugal). First, our spectroscopic analysis supports the occurrence of tetrahedrally-coordinated Ge4+ in chalcopyrite, independently from origins or zoning patterns observed for these minerals. 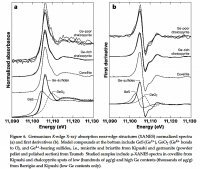 Then, based on statistical analyses of XRF chemical maps, we demonstrate that tetravalent germanium most likely incorporates chalcopyrite through the Fe crystallographic site via coupled substitutions with the following form : (2x + 3y)Fe3+<->(x + 2y)(Ge,Sn)4+ + x(Zn,Pb)2+ + y(Cu,Ag)+, although the presence of lattice vacancies cannot be completely excluded.